Leveraging the power of SEO is like the ultimate aim of all businesses, in order to establish their firm footing in the online world. Every company, whether a startup, small business, entrepreneur or multi-national knows that SEO is a ‘must-have’ component in their digital marketing strategy. Having a sound SEO strategy in place is not only important for building a conspicuous online presence for a business but is also an essential way of creating a using-friendly experience for visitors in an attempt to increase their reach to potential customers. Often SEO services are outsourced that promise a reputable and genuinely high ranking in the search engines. Certain digital agencies may speak on the basis of experience and promise high rewards whereas some agencies may even lure business to get their SEO done in a few hundred dollars. However, the need to differentiate between the two is highly essential to avoid spams and frauds and prevent the business from being penalized. A business should never compromise on quality due to financial constraints when considering their SEO budget as the cost of regaining brand equity can be far costlier then hiring professional SEO services. 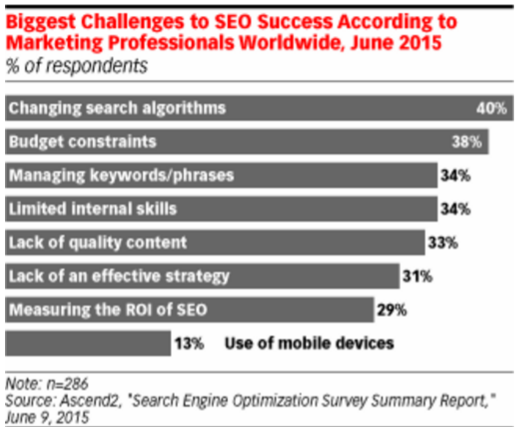 According to a report conducted by Ascend2 in 2015, budget constraints constitute to 38% of one of the biggest challenges to SEO success. Hence, businesses need to implement certain strategies to tackle this figure. On-page optimization of the website is often the first step towards being eligible to run the race of the best SEO strategy in the industry. Websites that neglect the optimization part in their website have low rankings due to the obvious fact that it results in sub-standard user-experience which deters them to make repeat visits. From spam links, duplicated content, to meta descriptions, all these loopholes can be possibly mended via basic SEO practices. Keeping your pages optimized and publishing high-quality and new content, there is no chance that your website will not earn a deserving position in the top of the search engine result pages (SERPs). 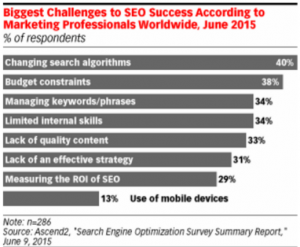 A major share of website optimization includes optimizing it for mobile and tablets. People use all kinds of devices to access your website and you need to make sure that is not a hindrance in turning website visitors into potential customers. According to socialmediatoday 70% of mobile searches lead to an online action within an hour. Furthermore, over 1.2 billion people access the web from their mobile devices. Such stats speak for themselves and hence give businesses the direction to channel their efforts and investment. Having a blog on your website as a startup can do wonders for your website and keeping it updated with new and fresh content relevant to the niche you are operating in is what you need to do. An ideal way to get quality content curated and created for your blog is sourcing it out to internal candidates in the organization. Delegate the authority of managing the blog to a content head and writing assignments be given to all the employees who can contribute to this initiative. In the beginning, even one weekly blog post will start getting things aligned and will be a great way to generate content that will ultimately prove to be beneficial for the entire SEO campaign. 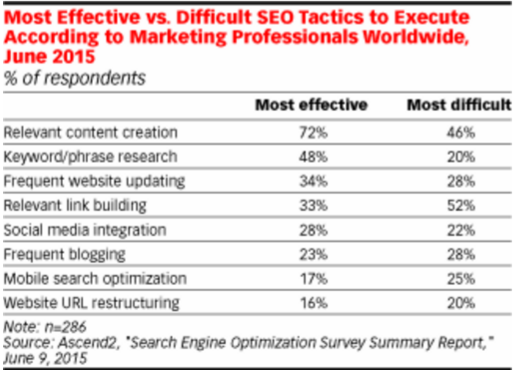 According to a report published in June 2015 by Ascend2, marketers in the global forum which account to 72% of them saying that creating relevant content was one of the most surefire ways of implementing SEO tactics. A great many SEO agencies are available out there to evaluate your needs and preferences and then devise a smart and well-rounded SEO strategy to suit your needs. Get into the details of the variety of services these agencies provide, go through their testimonials and try to get feedback from their past clients. It is not necessary that only an agency you charge high will provide quality services in fact you might find an agency you can fulfill your SEO needs and that too within your budget. Furthermore, you can even consider outsourcing your SEO needs to freelancers and individuals working as part-time or full-time contractors. They have flexible timings and workloads and you can work out what will suit best for your campaign. Why not analyze your SEO needs yourself and try to get a knack of it? With the innumerable resources at our fingertips you can set to learn atleast the basics of SEO like content marketing. You just need to invest substantial time. That does not mean that you will be devising your SEO strategy like an amateur but you can always take help form an outside agency or a service provider to help you take well-informed decisions. 4.Long-tail keyword strategy for the win! Long-tail keyword strategy goes hand in hand with narrowing your niche and specializing in a specific type of content. Make your content as relevant as possible with your niche and subtly embed with keywords that are most commonly searched for in search engines. You should never stuff your content with keywords just to rank high as search engines are constantly on designed smartly to catch these gimmicks. Keywords should be placed to catch the attention of the consumer and not for a tele-bot. Long-tail keywords are basically phrases that are extended in a particular context and are often searched for on Google. Long keywords fetch a higher ranking than short keywords and hence generate more web traffic. Optimizing for long-tail keywords is more easy nowadays as there are various online tolls like Webmaster Tools to research about the ideal keywords in this domain. Long-tail keywords often begin with identifying the primary keywords and can e built around it. It goes unsaid that the bigger and better your social media presence will be the more followers will pursue you and get your ranked hire in search engines. Connect with the local needs of your target audience as local search is ranking high in demand. This way you will add a more humanized and personal touch to your social interactions as you will be getting on the level of the customer to gauge what they need and hence serve them accordingly. Make sure you brand tells a personal story and reached out to people through the usual public ways of connecting with people. Vigorous social media campaigns can significantly boost your search ranks accompanied with the ideal approach to building an engaged audience and accurate syndication efforts that will help your content come into limelight. Cultivate and foster your following on social media channels and with each step you will see your ranking go higher up in Google searches. An article published on Impactbnd.com states that 76% of marketers are already leveraging the power of social media to form a base and boost their SEO efforts. 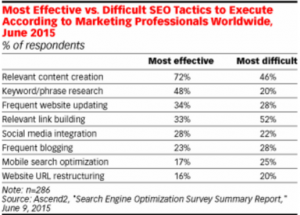 The effectiveness of Search-engine optimization (SEO) is no longer subjective to high volumes. This includes the number of inbound links, having an online presence for the greatest number of years or possessing the widest array of content. In fact, it is about the relevancy that you provide to your target market. Businesses go out of their way to build their visibility on online platforms and in search engines and competing in this talent hungry market scenario in a fairly decent budget is what the game is all about.